Click on an event's name for additional details. If you know of an educational activity or fundraising event related to blood clots, please let us know. 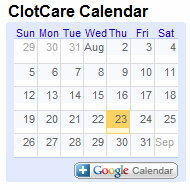 Contact Marie Bussey at webmaster@clotcare.org. All event times shown in Eastern Time. Please be sure to make the adjustment for local time!